“Air conditioning saved the South.” I distinctly remember my high school American history teacher repeating this as we reviewed economic growth in the U.S. during the mid- to late twentieth century. Whether you believe that reduced perspiration leads to economic growth or that economic growth spurs the demand for comfortable, less humid spaces, evolving building practice has proven that we can build much more efficient buildings today if we have the right tools – and the Southeast is taking action. codes, see the Building Codes Assistance Project. Building energy codes set minimum expectations for buildings to use energy more efficiently in states and localities that adopt them. Together, the development, adoption and enforcement of these improved codes is the glamour-less response to a transforming market, and an important and complementary force to leadership and innovation in the building sector. USGBC is coordinating its Build Better Codes campaign to facilitate engagement in state and local code processes and advancement in the codes towards minimum safeguards that ensure broad access to the benefits of better, greener buildings. 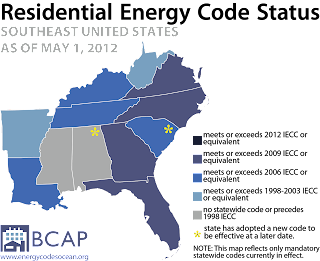 In the Southeast, there’s great news to report. Alabama: Following the November 2011 proposal to enact the state’s first statewide building energy code, the Alabama Energy and Residential Code Board approved the update on March 12. The state’s Legislative Review Committee is due to certify the code this month for implementation this October. Arkansas: In January, the state energy office finalized a rule to update the state’s commercial building energy code for the first time in eight years beginning in January 2013. The energy office is also reviewing a proposed update to the state residential energy code. Florida: In March, the state began implementing its latest building code containing energy efficiency requirements 20 percent more stringent than its previous code. Mississippi: A bill in the state legislature to update the state’s commercial building energy code for the first time in over three decades made a whole lot of progress in both chambers. While the bill ended up failing in conference committee last week, it is an encouraging sign for next session that the bill moved through both chambers with a lot of support. South Carolina: In April, Governor Haley signed a bill into law that updates the statewide building energy code to meet today’s most common building energy codes, a product – some might argue – of 2009 federal law (see Section 410 of ARRA). West Virginia: In April, the State Fire Marshal proposed a rule that would bring the state’s commercial and residential building energy codes up to date (from versions developed in 2003). Also in April, Governor Tomblin signed a bill into law that will apply more current building energy codes to publicly-funded buildings. As you probably know, the five other Southeastern states (Georgia, Kentucky, North Carolina, Tennessee and Virginia) made energy efficiency advancements in their codes last year. See USGBC’s 2011 report on state activity. With helpful compliance guides, a growing bank of resources, some healthy competition and a community to support the work, advocates and policymakers are increasingly equipped with what they need to mainstream building energy efficiency through the codes. Join our campaign through your local USGBC chapter today! God save the future residents who are ready to take big risk for saving few bucks. This green building's benefit like, quality, healthy and safe environments that are cost effective.